The other game is your receiving game, when your goal is to increase the precision of return and maximize the use of energy from your opponent's serve. Each of these games requires a different type of racquet, hence my recommendation of using two racquets: one for your service game and one for your receiving game. The two racquets should be of the same characteristics (frame, sting, tension, grip), but the returning racquet will be a little heavier than the service racquet. The difference in weight between the two racquets should be so small that the player cannot feel this difference. The bigger this difference is, the more pronounced are the benefits of using two racquets. We can objectively measure your sensitivity to weights in our Sports Engineering Lab. Why should the return racquet be heavier? There is a detailed explanation full of formulas, but the intuitive way to look at it is this: you are better off if the incoming ball hits a stone wall rather than a feather. While your racquet is neither a stone wall nor a feather, this thought may help you understand that up to a point a heavier racquet is better for your return game. A heavier racquet improves not only the speed of your return but also the precision (direction) of your return. In the case of the serve, the ball has no incoming energy, thus what counts is the speed (actually it is the square of the speed) of the racquet head. In other words during the serve you need to swing the racquet as fast as you can. You can achieve this by reducing the "swing weight" of the racquet (see simplified formula for swing weight). Luckily for us tennis players, this also increases the precision (direction) of the shot. The explanation of how the precision of the shot increases is outside the scope of this write-up. Remember that the difference between the two racquets is not noticeable by your haptic senses. So how will you know that the strategy works? You will notice the results in the statistics of the game. Please share your own experiences with me by writing to Racquet Science. Solution for the frugal tennis player. If you already have two identical racquets: Go to your trusted neighborhood ACE hardware store and buy a mechanical screw 1/4" diameter, 1/2" long, with a nut and two steel washers + two rubber washers (to protect the string of the racquet). The whole device should weight about 10-12 grams and should be fastened on the side of the sting, as close to the center of gravity of the racquet as possible. This is the weight that most of the people we tested failed to sense on their racquets. If you are like most people you will have to look for the screw on the racquet to notice the difference. If you have only one racquet buy the screws with butterfly nuts. It is a bit of a hassle to take the extra weight off and put it on again, but you only invest about 25 cents. The placement of the extra weight on the strings in not exactly "legal". You should not attempt to use this method in competitions, although you may claim it is a vibration dampener. Experiment with the two racquets approach at your club. If you like it just add extra lead tape to one of your racquets. Make sure you mark the "tweaked" racquet because you will not be able to tell the difference jut by picking it up! Notice that I recommend placing only one weight of 10 grams on one side rather than two weights of 5 grams on each side. There is a reason for this recommendation. 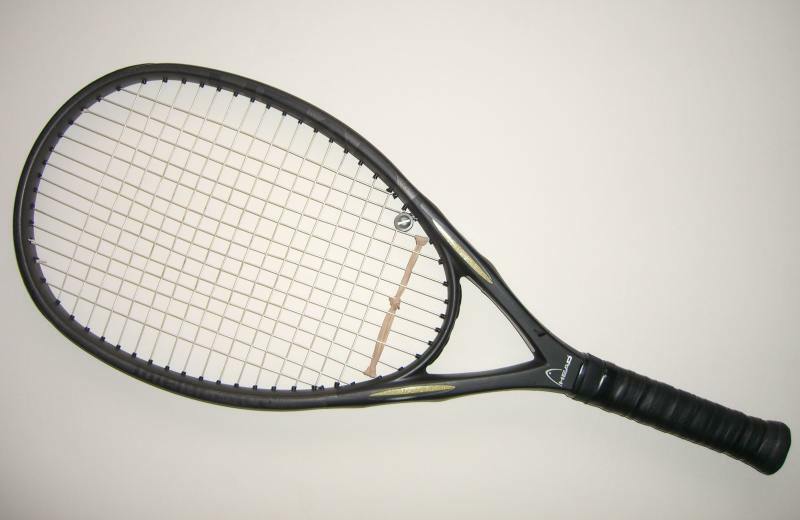 When you play, you should keep the racquet with the additional weight facing up (see image below). Note that the weight will face upwards both in forehand and in backhand shots. In addition to improving your return of serve, this placement will also increase your control of the top spin. Want to know why? Contact me at Racquet Science.